At the end of 2010, Google did something quite radical: they combined their organic ranking results with their existing Google Maps data to create a new service called Google Places. Google Places helps people find what they are looking for when searching locally. Each time a search is conducted on Google, organically displayed listings are displayed and each listing incorporates a title in addition to a short description. This is all that is seen until the visitor clicks through to a particular website. However, each time a potential customer uses Google to search for a certain area of interest in a given location, it is extremely likely they end up seeing a results page which contains a Google Places listing. This kind of listing includes a map with several businesses pinpointed in addition to their basic information such as a local phone number and an address. It seems sensible that if someone is trying to find a local business, they should find the same rather than a well-optimized website. Google has therefore taken the position that local businesses should have an edge with regards to local search. 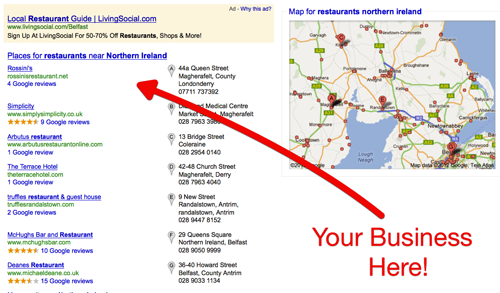 In simple terms, Google have optimised their search engine results pages for local businesses. This is why all business owners should promote their business using Google Places. When someone searching Google encounters a Google Places Listing, it basically results in more sales conversions for the business in that listing as people tend to make a phone call to the business directly as opposed to click through to a business website or a more in depth Google Places listing. Google Places delivers a trusted communication channel so that consumers are able to connect, interact with and develop a genuine, more personal relationship with their local businesses. Google Places can boost the quantity of targeted visitors from geographical search keywords. Google Places has more trust than pay-per-click advertising: Organic search results are lists that naturally display in the results pages of the search engines. Most search engine results pages have a combination of paid and organic advertisements. The organic ones are frequently the most trusted by the general public as these are results which have been gained over a period of time. Compare that to paid listings where the site controller can just bid on any keywords that they like, and their website could, if they wish, have nothing at all to do with the searched keywords. Google Places is succinct. It allows your prospective clients the opportunity to begin to know you and what you have to offer in a lot less time than it would most likely take to look through your internet site. Google Places results have the potential to show up on both Google Map searches as well as for local searches. With Google Places results it is possible to outrank other more established businesses. Search engines are notoriously challenging to rank for but with Google Places, you can rapidly jump to the top of the listings even with a brand new website. By using citations and reviews, your Google Places listing will progress in ranking. With higher ranking, your cost-free advertising with Google Places will give you more targeted customers quicker than traditional organic methods. When your Google Places listing is optimized properly, your business has the potential to appear on the first page of Google. Mobile phone users can discover your Google Places listing easily, and they do not require a computer to do so. If they are on foot and close to your business, then they may even start walking towards you. Google places pages tend to be more important for businesses that serve a particular geographic area, for instance a gas heating engineer or electrician, and not as important for say a web design company. Google Places is extremely simple to use and easy to manage. Your website, postal address, and your phone number are displayed within your Google Places listing, enabling customers to locate you faster and to obtain the information they require. Photo Shoots for Free – If you are operating a business located in a major city, Google Places may be prepared to visit your business premises to take some professional high quality photographs free of charge. Google do this as it enhances the quality of their search results. Also, it makes it possible for Google to confirm that you are an authentic business. The Google Places interface enables the business to entirely manage what is seen in the Search Engine Results Pages. They can update online videos and images, give information such as their opening hours, and more importantly, the listing may also show reviews written by previously satisfied customers. Your Google Places page can offer discounts and coupons and this will further entice customers to buy from you. Online advertising like Google Places is the future, and it will replace paper phone directories. If someone is looking for businesses within your town, they are more likely to use the Internet as opposed to the Yellow Pages. It’s not enough to have a Google Places listing. You will want to make sure that you are showing up on the first page of the Google Search Engine Results Pages, in exactly the same way that it is important to be on the first page of organic rankings. If you would like help setting up your own Google Places listing and achieving a high ranking, it makes sense to bring a Google Places expert or local SEO expert on board. The return on investment will likely be high in comparison to your tiny outlay. I recently had some difficulty calling a simple PHP script from within the Magento eCommerce Platform. Although the following example focuses on calling a VoltRank PHP script, you can replace the code within VRank.phtml with your own PHP script. Using the Magento GUI interface, navigate to CMS->Static Blocks and select the block to be edited. In this case, I am editing the Footer Left block. Create the highlighted code to call the template code. Any errors should then display on the page if there is a problem with the PHP. Otherwise, your Magento eCommerce CMS should be successfully calling your VoltRank PHP code! In addition to using VoltRank to increase traffic to your website and push it higher in the search engines, you may want to build some links to your website using Linxboss and at the same time get 125-150 FREE LINKS to your website. See our Linxboss Review for further information.